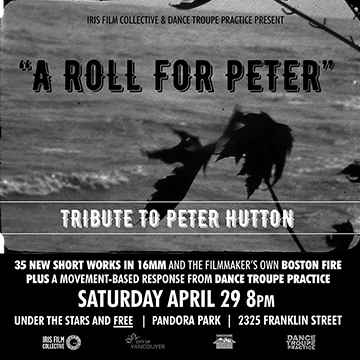 Iris Film Collective, in collaboration with Dance Troupe Practice is pleased to present “A Roll For Peter”, the touring program of films made in tribute to the late great filmmaker Peter Hutton. The films come to Vancouver in serendipitous confluence with two screenings as part of the DIM series at The Pacific Cinematheque of Hutton’s work (the second takes place on April 26). Hutton, an American artist and educator, developed a unique perspective on both urban and remote landscapes through his images from the early 1970’s until his death in 2016.